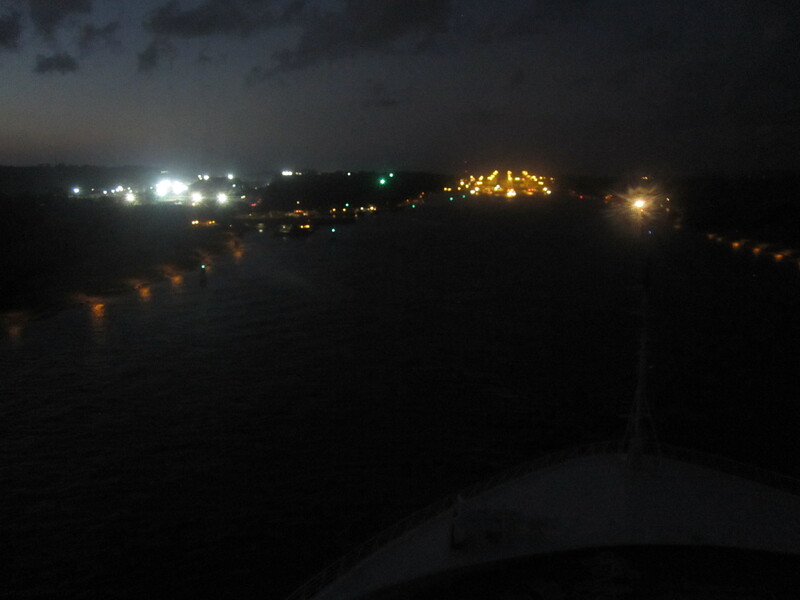 Our Panama Canal day actually started in the middle of the night. We knew if we wanted a prime spot we had to more or less camp for it, so that’s exactly what we did….sort of. We awoke before the sunrise and made our way forward on deck 14 at roughly 5am. I had expected half the passengers to already be out but it wasn’t quite as packed, not yet anyway! We found ourselves a nice spot on the roof above the bridge and that was where we would call home for the next 4 hours or so. 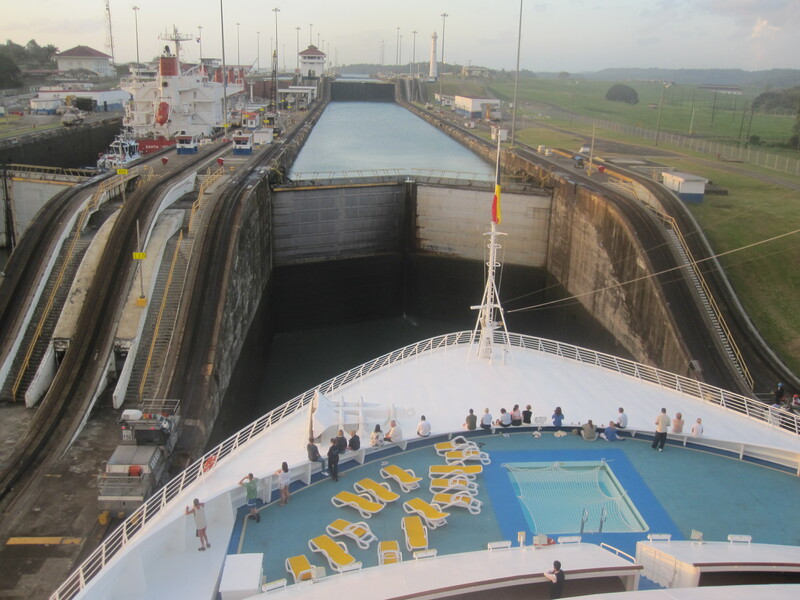 The approach felt like it took forever but before long we were entering the Gatun Locks and finally starting to see what was in store and what a sight it was. We were the only cruise ship and apparently passenger ships take priority over any others so there was no waiting around for us. 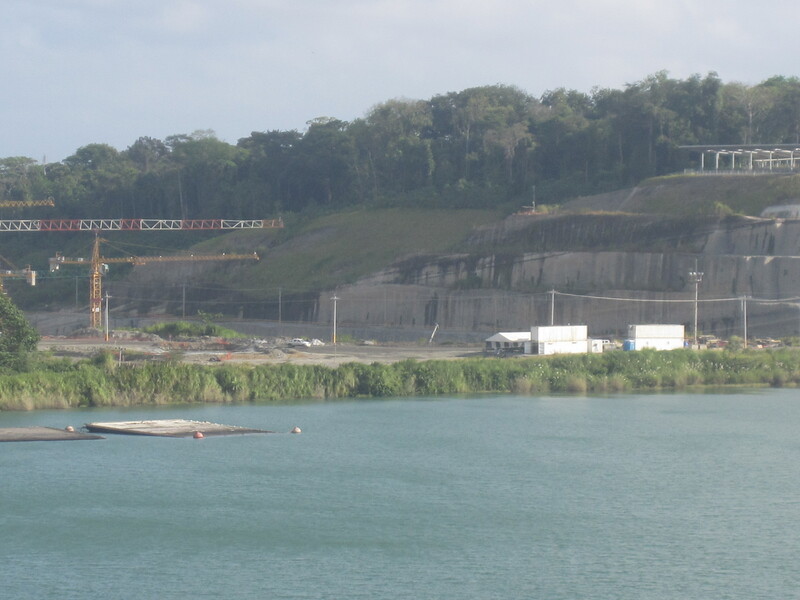 I had heard so many stories about the Panama Canal and had longed to see it and experience it for myself, finally my time had come and I was in awe at how the whole process worked. It really is an engineering masterpiece and I know I definitely would not like to have the responsibility of taking any kind of vessel through it, not even an inflatable boat you buy for the beach! The area surrounding the locks was very beautiful, lots of wildlife including Pelicans and Eagles and green lush jungle on one side for as far as the eye could see. It was the kind of place I would have enjoyed exploring on foot until I ran into some kind tropical South American spider that wanted to destroy me. Being on the ship and going through it was just as much fun as watching the other ships coming through. The water levels for us all were changing constantly so one minute we towered above the vessel in the opposite lock and the next they had a great view of our Lido deck. 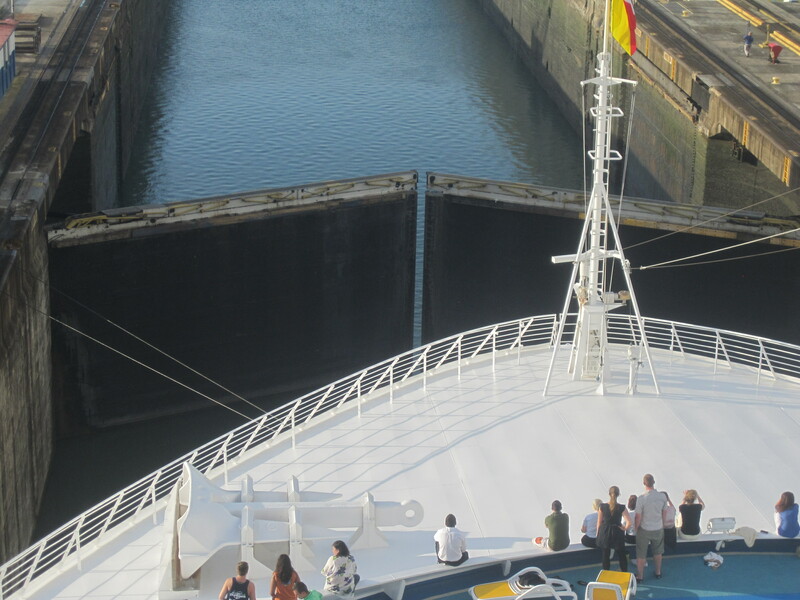 The ships were so close, only a narrow long section of concrete separated us and kept us in our own locks and one little train pulling us along on either side kept us from crashing into it! I remember going down to deck 5 for something at one point and through the windows all you could see was concrete, which will give you an idea of how low the ship is actually pulled in order to move through to the next lock, it’s rare, very rare for deck 5 to have its windows blocked out. Once we exited the last of the Gatun locks we found ourselves in the Gatun Lake, this is where we would sit for an hour or two before it was time to do it all again. As we exited the last lock, the ships thrusters kicked in and she was moving under her own steam again. It was quite an interesting exit actually as there were ships EVERYWHERE! As soon as we were clear of any land obstacles it really was a case of hard to Port and the ship leaned precariously to turn and avoid anything that was around her, which included the rather large and ugly Grand Champion who clearly was moving out of nobody’s way. We had moved so slow for the last few hours and now we were racing through. It was an odd feeling and for a second or two I thought to myself if he turns the ship any harder we are going to capsize! We weren’t, obviously! But that’s how it felt at the time, briefly. Construction of the new locks is firmly underway. We bobbed around in the Lake for just over an hour if I remember correctly. Admiring the views, watching the other ships coming and going and catching brief glimpses at the work so far on the new sets of locks they are constructing. These locks are due to open in 2014 and will allow bigger ships to make the transit from the Atlantic to the Pacific. 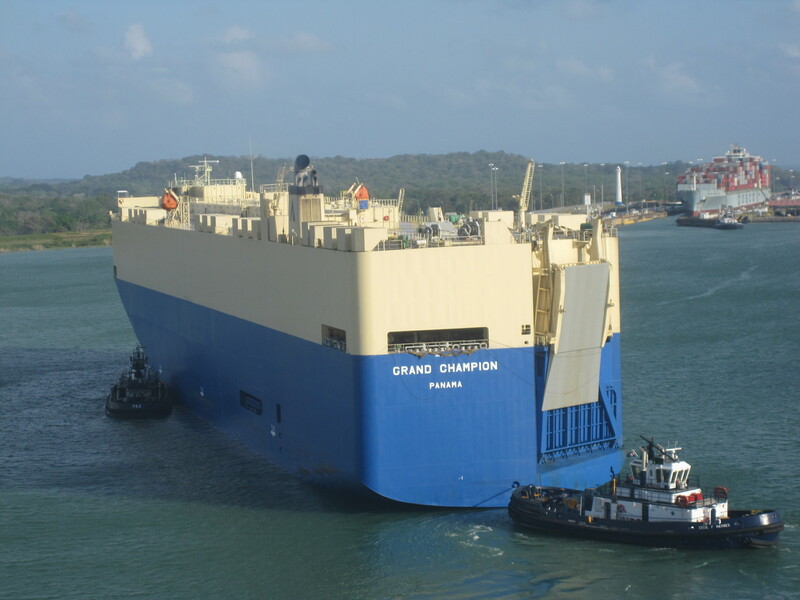 Oceana weighs in at 77,499 tonnes and is currently classed as a Panamax ship. This means she is the maximum size in length, beam, draft and air draft that a ship can be to transit the current locks. Before we got to the Canal they lowered the lifeboats slightly on deck 7, I believe this is because it has an effect on the ships air draft but I am not entirely sure, if I am incorrect and you know then please leave a comment. Our transit was partial, I expect the full transit to the Pacific side must be amazing and probably where the crocs were that I had been dying to see and ultimately didn’t even see half a one. I enjoyed the transit very much but at the same time it was bitter sweet because we only got to see a portion of it. It also cost over $350,000 for us to do it!! Everyone by now knows for me it’s not just about cruise ships, it’s about anything to do with any kind of ship so I think I secretly enjoyed the Panama Canal a lot more than some of the other people onboard did. Many felt it was a waste of money and it would have been spent better by letting us have another port of call in the Caribbean. This wasn’t the case for me, I was truly fascinated by it and I enjoyed watching the container ships squeeze themselves through. 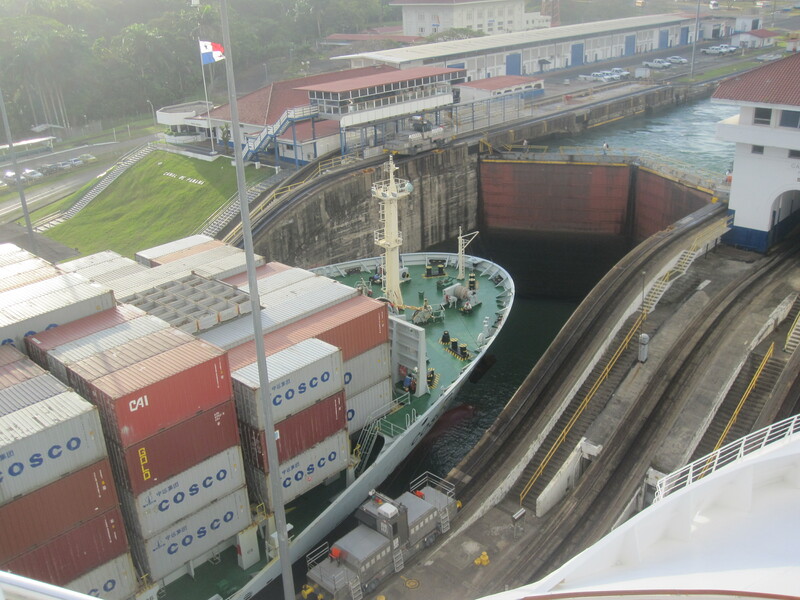 I am happy that I can now say yes, I have transited the Panama Canal! Maybe not all of it but I was there and I’m sure before my time is up I will go back and do the whole thing. I have added a photo album to the CruiseMiss facebook which shows our entire transit and there are some videos below. I just find it so amazing that the ships even fit through such a narrow space!